​In the summer of 2018 I had a thought, a wild thought. 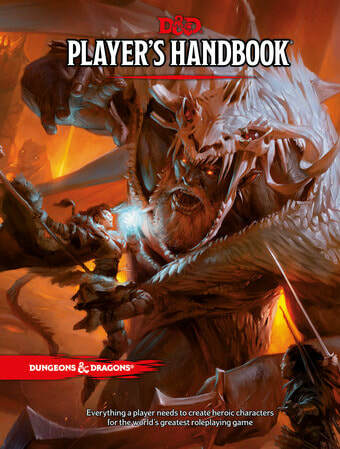 There are many commonalities between the framework of roleplaying games such as Dungeons & Dragons and the way in which we design classes and assignments. It was this thought that led me to explore how such a framework could be implemented in a class. I've created this page to offer you an insight into my mind and my classroom. As this experiment continues, I will continue to update this page with what I've learned and any changes I've made to tackle problems as they've arisen. To start, Dungeons & Dragons is a roleplaying game in which players create characters and complete quests designed by a dungeon master. Vox has a helpful explainer here. "The Dungeons & Dragons game consists of a group of characters embarking on an adventure that the Dungeon Master presents to them. Each character brings particular capabilities to the adventure in the form of ability scores and skills, class features, racial traits, equipment, and magic items. Every character is different, with various strengths and weaknesses, so the best party of adventurers is one in which the characters complement each other and cover the weaknesses of their companions. The adventurers must cooperate to successfully complete the adventure." A class is, in many ways, much the same as a roleplaying game. Students are expected to be active participants (roleplay), and to do well in the class (the campaign) they are also expected to complete various assignments (or quests). A successful learning environment also requires students to recognize that they're not in this alone. To do well they must work together, respect one another, recognize each others strengths and weaknesses, and cooperate successfully to not only defeat whatever assignments (monsters or quests) that I (the dungeon master) put in their way, but also to grow as characters and develop the skills they need to tackle harder classes (or campaigns). Although there have been many attempts to add a familiar gaming structure to assignments, see for example the levels system (here and here), by going all-in on the similarities between roleplaying games and a class I'm hoping to achieve the following aims. I can make explicit the connection between the course goals and objectives and the different assignments I ask of students by demonstrating what skills each type of assignment is designed to test. The roleplaying game structure provides students with some freedom to choose which assignments to complete. This puts them in charge and lets them choose how to engage with the material. However, the freedom to choose is not complete freedom, the freedom is limited. Too much freedom in choosing assignments can itself be a source of debilitating stress. Role-playing games are highly structured, but there is also freedom in that structure. Learning is not just about their final grade, it is also about developing transferrable skills that they can take with them in future courses and in life in general. I can make clear, then, that my task as their professor is to not only covey information but also to provide them with the opportunities to hone their skills, gain experience points, and level up so that they can tackle harder and more difficult campaigns (classes). Many of my classes (for example, the challenge of evil) discuss material that is not only difficult in the standard sense—students will have to spend time reading and rereading in order to get a good grasp on the readings—but it is also difficult in a human sense. To be fully engaged, to fully take on the depth of human evil or the extent of structural racism, sexism, etc. is a lot. Some people have the constitution for it, some don’t, but regardless we all need to find ways of engaging. By “gamifying” the assignment structure, I can provide students with an out. A way of stepping back and applying a a familiar gaming framework of skills, XP, and levelling up not with the aim of trivializing the material, but with the aim of giving them the resources to escape when they need to escape. The assignment guide for PHIL034 is available here. The character sheet assignment for PHIL034 is available here. This is a lot, it's not perfect, and it is going through constant revision. I plan to eventually replace this page with a guide to how apply this kind of structure to a class but I'm still very much in the process of still figuring it all out. Below, for example, are a number of changes I plan to implement next time I teach a course with this assignment structure. I plan to have students do a self-assessment exercise (akin to a Dungeons & Dragons alignment test) in our first class session in which they can they reflect on whether their skills lay in essay writing, debating, active learning, group work vs independent work, or taking exams. Students then receive a preliminary distribution of stats based on their strengths and weaknesses when they entered the class. This would give students more of a personalized sense of how they've grown based on the assignments they've completed. Connected to this first change, I plan to loosen/add more freedom to the assignment structure so that students can choose "tracks" based on either playing to their strengths to boost an area they're already strong in or aiming to become more well-rounded by working on their weaknesses. For example, more opportunities to do exams instead of papers, or opportunities to do longer and harder papers that test their skills of insight and analysis instead of shorter comprehension papers. To prevent students from either aiming too low out of self-doubt or playing only to their strengths, a variety of assignments will still be required, but additionally, there will be the potential extra XP or stats boosts for assignments outside of their wheelhouse. There is currently a disconnect between levels, XP, stats, and their final grade. Inspired by Ryan Windeknecht's implementation of a D&D structure in his courses, I plan to make levels more directly correlated with a student's grade and XP would then become a simple multiplier and come to more closely reflect how XP is calculated in D&D more generally. This makes the levels clearer and a more accurate reflection of a student's grade. Is this too gimmicky? I have concerns about using this structure in upper division classes, but there may be modifications to it that avoid the worries I have. This point is just to say that I have some as-of-yet unarticulated worries so watch this space. I've gotten feedback, advice, and inspiration from a number of people, and I want to take a moment to acknowledge them all here: Gabbrielle Johnson, Maegan Fairchild, Regina Rini, Amy Kind, Dustin Locke, Suzanne Obdrzalek, Beth Valentine, Tim Burrows, and Ryan Windeknecht.